Those with long memories will recall Nette Robinson living and gigging on the Island. Since then, she has developed - when indulging her passion for chess - into a much in-demand vocalist, who has been described in the jazz press as someone who "when she sings, she swings with a velvety voice and impeccable jazz timing". 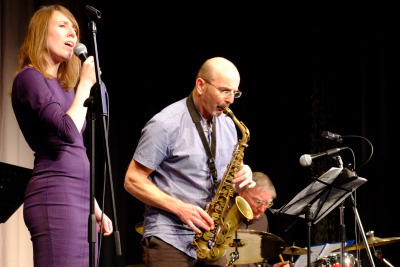 Nette certainly fulfilled that review with her 15-number set at Newport Jazz Club on Sunday afternoon, when she was accompanied by Leeds School of Music graduate Tony Woods on saxophone. With a set of standards including Isn't it Romantic and You Must Believe in Spring, as well as a couple of original numbers from pianist Peter Trueman, she took away the winter chill with the warmth of her personality and finished with an encore of Take the A Train. Support was supplied by the Phoenix Modern Jazz Trio, comprising Peter Trueman on piano, Mike Whitehead on bass and Bill Wills on drums.